The food and beverage industry has a special responsibility to ensure the product-out-the-door is safe for the consumer, while also ensuring the production process is safe for employees. 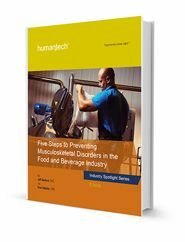 Several unique factors including wet/cold environments, FDA regulations, sanitation requirements, and a complex supply chain can make managing musculoskeletal disorders (MSDs) challenging. This e-book, part of our industry spotlight series, outlines methods to mitigate MSD risks and improve the ergonomics process. It is critical to design the workplace right the first time in this industry because you rarely get a chance to make retrofits. The profit margin on the final product is typically quite small.